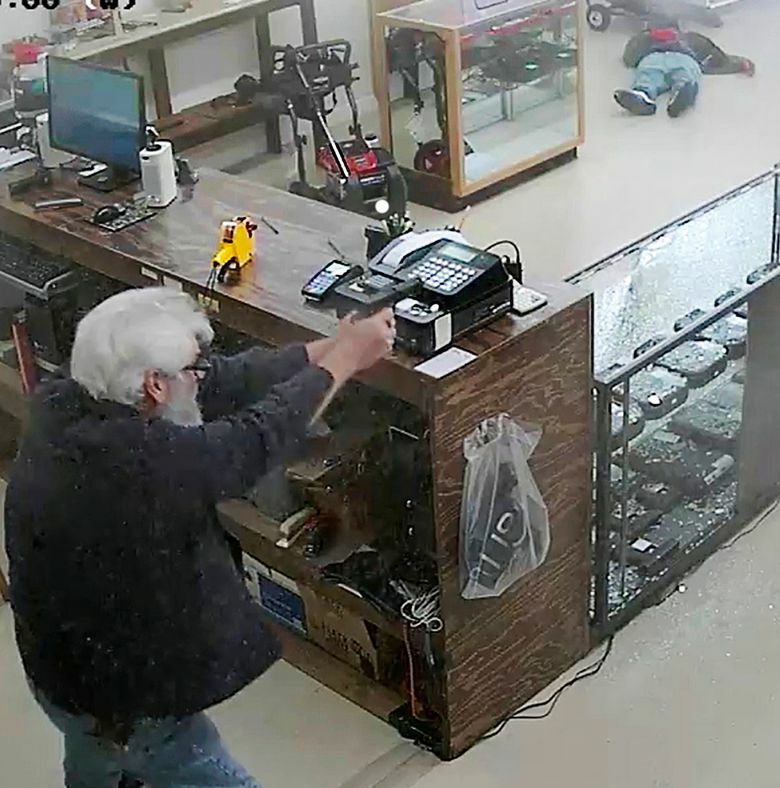 MABLETON, Ga. (AP) — A Georgia gun store owner’s quick reflexes and skilled marksmanship may have saved his life and others when armed robbers came calling. Surveillance video shows Jimmy Groover, owner of Dixie Gun and Pawn, turning around when two suspects walk into his store on Dec. 26. Another employee raises his hands as the suspects charge in. “I saw the mask and the gun at the same time, and I knew it was him or me,” Groover told The Associated Press on Thursday, adding that he acted to protect himself, his employee and two customers who were in the store. The suspect draws a second gun and Groover fires at least two shots at the first suspect, who immediately falls to the floor on his back, both guns falling from his hands. As the suspect fell, he fired a bullet that shattered the counter’s glass case and lodged in a door just inches from where Groover was standing, he said. Groover appears to fire several shots toward the other suspect, as he turns and flees. Smoke from the gunshots fills the store. The suspect who was shot, 30-year-old Donovan Chopin, died at the scene, police said. The investigation into attempted robbery is ongoing and the second suspect has not been caught, Cobb County police Officer Alicia Chilton said. Groover doesn’t face any charges, Chilton said. In the 30 years that Groover, 64, has owned a gun store, this was the first time he’s been present when someone tried to rob him. But there have been 18 burglaries at his store and about a dozen attempted burglaries over those three decades, he said. When an AP reporter visited his store Thursday, Cobb County police officers were there, downloading surveillance video from an attempted burglary on Jan. 6. Since news of the shooting, Groover said he’s received calls from around the country.